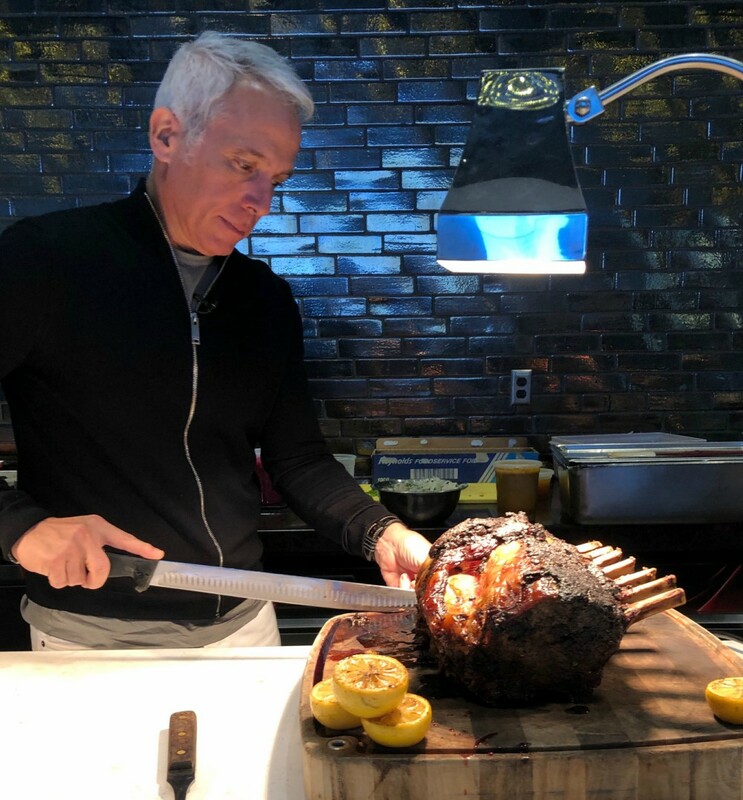 This season, celebrity chef and restaurateur, Geoffrey Zakarian, most known for dishing it out on the Food Network, heated up Miami diners and took over the Flagship Lounge at the AmericanAirlines Arena with notable eats from The Diplomat Beach Resort’s Point Royal. And with the Heat’s Chef Partner Program transforming their Flagship Lounge into eclectic culinary concepts throughout the year, premium members were able to toast to 2019 with a five star chef who represents the best of the best. 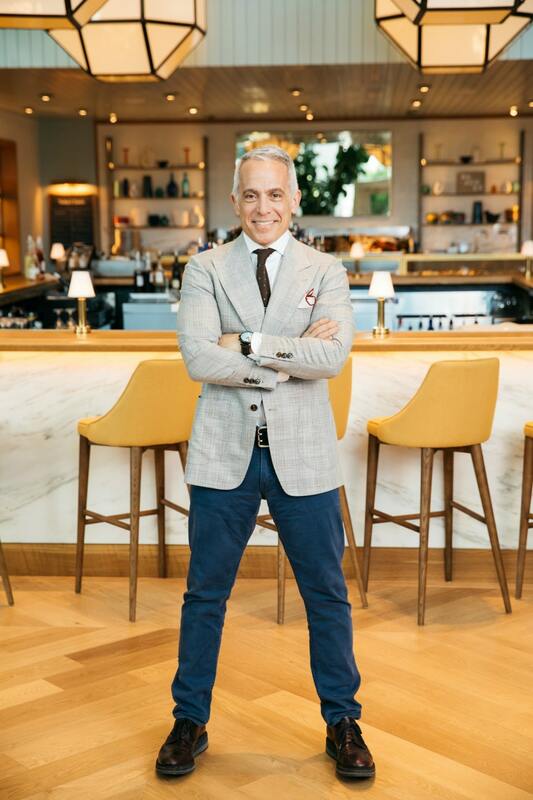 So we sat down with Zakarian to hear more about this one-of-a-kind partnership, what signature plates premium members nibbled on off the bleachers, his favorite moments on the Food Network, and what we can look forward to at this coming year’s South Beach Wine and Food Festival. Geoffrey, tell us about partnering with Miami Heat, as part of The Diplomat Beach Resort’s first-ever culinary partnership, with our hometown all-star team. GEOFFREY ZAKARIAN: What an incredible experience. We did a VIP dinner from Point Royal for a one-of-a-kind experience. The Heat made me a Zakarian jersey and I got to test my skills on the court for fun. I’ve been thinking about turning pro. What do you think? I’m thinking MVP! Speaking of, what champion dishes did you serve? GZ: We served an astonishing amount of food! A few of the offerings were spinach and wild arugula with pumpkin seeds, and carrot yogurt, our signature raw bar set up with chilled shrimp, crab legs, and lobster, and a classic clam bake with Maine mussels and clams, crawfish, shrimp, baby corn, and peanut potatoes. What spirits did you recommend pairing with these eclectic dishes? GZ: We have a robust cocktail program at our bar and I think beverages are such an exciting part of the meal. My personal choices would be a Negroni, a classic Manhattan or Tequila Sunrise. Champagne is never a bad choice either! I have to ask, who’s your favorite Miami Heat player and were you able to play one-on-one with them? GZ: Kelly Olynyk. Let me tell you what I did do, stand next to them. Humbling. Geoffrey, you’re a leader in the culinary world. How did your journey first begin as America’s ultimate top chef? GZ: It started at the Culinary Institute of America. The best place to start if you want to be a professional chef. The way in which Tim Ryan leads the school is impressive. Known for your sophisticated taste, you first worked at New York’s Le Cirque. How did Le Cirque shape you into becoming the chef you are today? GZ: That kitchen had access to the most amazing ingredients. It was incredible. Now everyone can get pretty much everything but in those days, it all hit the kitchen at Le Cirque first. I had this incredible opportunity to learn how to cook with things I would never have had access too. Also, Sirio Maccioni—the owner of Le Cirque—from him I learned the true art of hospitality. Fun fact: Who first inspired you and what was the first dish you ever made? GZ: My Aunt Anna. She was an amazing cook. Stuffed grape leaves was a dish we made together all the time. Not sure if it was the first, but definitely one she taught me to perfect. You recently published a cookbook coined My Perfect Pantry. If you could fill a pantry inside a Miami home, what would be inside of it? GZ: You don’t need everything. You just need the right things. The book is laid out around the 50 ingredients any home cook should have on hand to make delicious, easy meals. In addition to being a writer and esteemed restaurateur, you’re also a judge on Food Network’s Chopped, an Iron Chef, and co-host on Food Network’s Emmy-nominated daytime series, The Kitchen. How did you jumpstart your career on the Food Network? GZ: Chopped! It was a little show that became a big hit! I can’t believe how popular it became. I had been cooking for 25 years already, so when the TV thing took off it was a cool addition to my career as a chef and restaurateur. I love teaching so it was a great natural progression. One of my favorite things to film is Iron Chef. There’s nothing quite like Kitchen Stadium. Do you have plans to add an additional show? GZ: Yes, my production company Corner Table Entertainment is working some very exciting multi-platform concepts. Can’t share anything just yet, but keep an eye out. With Food Network South Beach Wine and Food Festival nearing this February, what can guests look forward to experiencing? GZ: I’m hosting a Bloody Mary Brunch with Jeff Mauro on the Sunday of that weekend to close out the festival. It’s an annual event at Point Royal. Always a sell out, so get your tickets early! And, if you could give advice to local chefs looking to be the next Geoffrey Zakarian, what would you say? GZ: Arrive to work early and work harder than anyone else!